Hello Wellness is your comprehensive Family Medical Clinic committed to exceeding your expectations as a Primary Care Clinic. Brian Bracy, MD is board certified in Family Medicine and treats patients of all ages for chronic and urgent care conditions. Welcome to the official Hello Wellness Blogspot! We are glad that you are here! We will be providing information about the clinic, our services, and our hours of operation. We will also periodically be discussing medical topics and hope to cover a different topic every month. We hope that you will find this site informative and useful. This site is meant to provide basic medical information and knowledge and should not serve as a substitution for situations involving urgent or emergent illness. Obviously, if you have any questions whatsoever you are encouraged to call our clinic at 479-249-6362, between 7am-5pm. Also, email us at well@helloprimarycare.com. 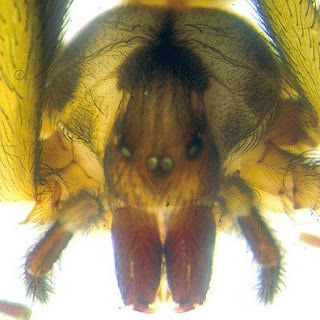 Recluse Spiders (Genus Loxosceles) are sometimes known as violin spiders, fiddleback spiders, and nonspecifically brown spiders. 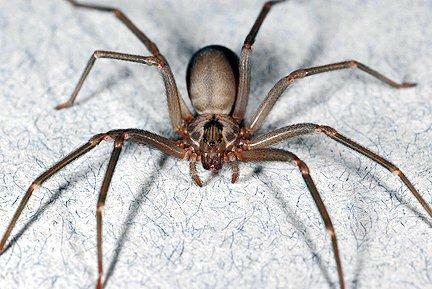 In the U.S. there are 6-13 species of recluse spiders. 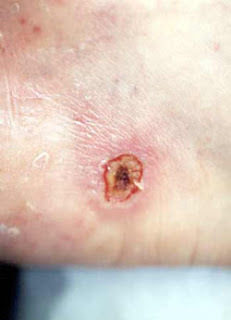 They have gained notoriety in medical literature and lay press because sometimes their bites can become necrotic, meaning that that they can cause areas of skin and underlying tissue destruction. In some cases these areas of destruction can be quite large. Recluse Spiders are usually found along the Mississippi River basins, southern, southwestern and midwestern states. They are a synanthropic spider(i.e. their population numbers increase in association with humans). Therefore, they are usually encountered in homes, apartments, dorms, or condominiums. More specifically they are typically found in the basements of homes, attics, behind bookshelves and dressers, underside of furniture, along baseboards and in cupboards. They prefer dark and undisturbed areas, hence their name. Recluse spiders are rather nondescript brown spiders. The most accurate method of identifying a recluse spider involves counting the eyes. Most spiders have eight eyes in two rows of four, recluse spiders have six eyes with a pair on both sides and a gap between the pairs. Using body markings is probably less reliable. 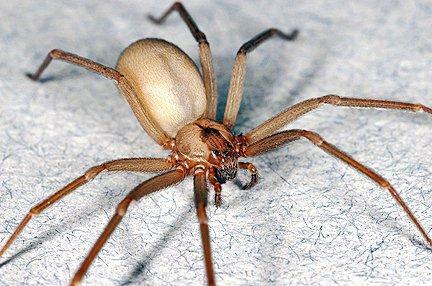 The brown recluse is described as having a violin pattern on it's front segment. Sometimes body marking can be misinterpreted and many young spiders do not have this body marking. Some other features of Brown Recluse Spiders include monochromatic legs, abdomen, and fine hairs on the legs. The issue with Brown Recluse bites is that their venom contains many Biologically active enzymes, one of which is called Sphingomyelinase D. It is thought that this enzyme is predominantly responsible for skin and soft tissue breakdown. Most of the clinically significant bites occur on our younger patients and on areas with thin skin. Their fangs cannot penetrate thicker skin. The initial bite of a Brown Recluse is typically painless. Patients often are unaware that they have been bitten. They tend to only bite as a last line of defense, i.e. being crushed between flesh and some object. This happens most frequently indoors; such as, rolling over on one in bed, putting footwear or clothing on where the spider has taken refuge. 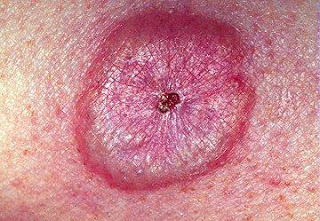 Bites typically occur on the upper arm, thorax, or inner thigh. They are rarely on the face or hands. 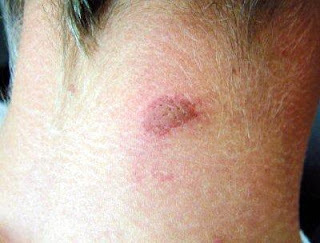 Again, patients are frequently unaware of being bitten, but bites can develop burning, itching, or pain. The initial bite can range from unrealized with no symptoms, to a slightly painful mosquito type bite. It may develop into a reddish to purplish plaque on the skin with pain over the next approximately 2-8 hours. The pain also will tend to increase over the next 2-8 hours. In most cases, these signs and symptoms otherwise known as the "local response" are self-limited and total resolution occurs within one week. These symptoms are often very variable. Most confirmed bites will resolve with no scarring or other symptoms at this stage. Some bites can progress to various degrees of necrosis, but again this is a minority of them. The plaque will tend to develop a dusky red or blue color in the center of the lesion. The center will become black with a pale area surrounding it and then redness surrounding that area. A depression in the skin(ulcer) will then form in about three days if there is continued tissue destruction. The ulcer is usually dry, but can be moist around the edges. There are usually no systemic or body wide symptoms, but fever, muscle aches, nausea nad vomiting, as well as general fatigue could develop. The tissue destruction may continue, but can stop at any point and the lesion can heal. Healing for the lesion at this point could take up to 8 weeks. Of course, we all have seen pictures or heard where the tissue destruction is quite extensive. Sometimes these ulcers require formal debridement in the operating room. This unfortunately can happen, but again is rare. Most times Brown Recluse bite cannot be diagnosed unless the spider is actually killed and identified or the spider was observed inflicting signs and symptoms that subsequently develop. The bites that are most likely to develop clinical problems are the bites that occur on skin over more fatty tissue, i.e. buttocks, inner thighs. 1. Reducing the risk of a Brown Recluse bite probably begins with prevention. It is probably a good idea to have your entire dwelling treated by a professional exterminator. While this issue is not specifically addressed in medical literature it is probably a good idea to treat your dwelling at least once a year. Of course, you can do it yourself and the results can be equivalent to a professional. 2. If there is a confirmed bite from a Brown Recluse(spider killed and identified), or any other spider bite that is significant, then the patient needs to seek medical treatment if only to be evaluated for their tetanus immune status. 3. Local wound care begins with cleansing with a good antibacterial soap. 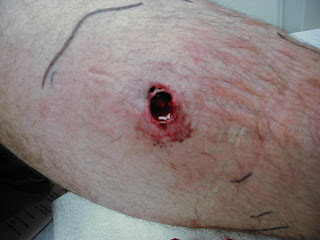 Cutting the bite open and performing suction and/or draining, tourniquets, meat tenderizer, or ice therapy are usually not indicated. 4. If there is pain then you can treat with Tylenol or Ibuprofen if there are no allergies to these medications. 5. Some medications and treatment strategies have been reported to prevent progression to necrosis, but most of these are based on animal studies and not been fully tested on humans. However, there are some strategies that physicians have used with success to prevent the bite from forming a bad ulcerating wound that we sort of associate with the Brown Recluse. Your doctor is usually up-to-date on the most effective treatment strategy for Brown Recluse bites. 6. Always keep a close eye on the bite and watch for incresed redness, spreading redness around the bite site or any indications that a true wound is forming or if it appears that the wound is growing. You should seek medical help as soon as possible if these characteristics are present. Antibiotics may be needed for a secondary bacterial infection. Initially, it is very hard to determine if the bite will grow to a necrotic wound, but again, the odds are in favor of it not. We will always tell you that if there are any concerns whatsoever then make an appointment with your doctor as soon as possible.